Design Rhythmics Sonification Research Lab works with scientists and museums to turn information and data into music. Why music? Not only do we love music, but it just so happens that music is composed of a very rich palette of qualities upon which data may be mapped and thereby perceived by the brain through the auditory channel. Music stimulates cognition and memory, and offers those who are blind or visually handicapped the opportunity to understand information and gain knowledge in new ways. By working with scientists who are shedding new light on our world, and the museums and centers who are helping to disseminate it, we seek to create innovative, pleasurable and accessible audio information presentation solutions for the public to "get it" by hearing. Whether online or live, our work makes science accessible to more people through listening to the music of the spheres. Created by computer scientist and composer/percussionist Marty Quinn, these sonifications demonstrate how data of all kinds can be translated into music for the purposes of expanding and enhancing our perception of the earth and our environment. Dr. Rita Colwell, former director of The National Science Foundation, cited this work in one of her speeches for being an innovative merging of art and science. In 2009 , we toured "Walk on the Sun" (see pictures above) as part of new NASA sponsored program under the title "Light Runners". We showed the exhibit for a week at a time in 12 cities at science centers and run special programs for those who are blind and visually impaired at the science center or at centers for the blind. We are pleased to announce the exhibit may now be purchased from DRSRL. See the exhibits link or click here for details on Walk on the Sun. The Light Runners program was based on a 2-year NASA Ideas grant to create a museum exhibit based on sonified, musically encoded representations of data and imagery from the STEREO Space Mission. New image sonification and visualization techniques for solar images and data has also led directly to new techniques to present works of art, increasing the accessible of art by making the content of paintings generate music based on the color data present in the pixels in a photograph of the art. We showcased and discussing these approaches at the Astronomical Society of the Pacific conference poster session on Sept 6th, 2007 in Chicago and the Soundscapes panel at the Art Education for the Blind 2007 Conference in NYC Sept 29, 2007 sponsored by Art Beyond Site and the MET. The grant included collaboration with the Christa McAuliffe Planetarium in Concord, NH and UC Berkeley's Space Science Lab. See ArtMusic to see and hear examples of art as music. Where is the water more prevalent, the poles or the equator? Which latitude exhibited the highest water content? Why are the drums louder in the equatorial regions? Why do the patterns of music change with the months at some latitudes? What is the perceptive and cognitive effects hearing all variables at once vs one at a time? Planet_Name,Pl._Masse, Pl._Period, Pl._Semi-axis, Pl._Pl._Ecc., Pl._Incl., Ang._Dist., St._Dist, St._Spec._Type, St._Mass, St._[Fe__H], St._Right_Asc., St._Decli. Each row is presented within the duration of a measure, with variables presented at strategic points within the rhythm of the measure. This gives the mind a chance to hear individual variables, while still retaining the concept that they belong together. It is a system of data, one row, that is presented in one measure of music, the next measure contains a different system, the next row, and so forth till the end of the file. 2.1. The first four beats presents the star data. 2.2. The second four beats presents the exoplanet data. 2.3. The two beats at the end act as a pause or separator between planet/star or row presentations. The higher pitched the strings, the closer the star. The louder the snare drum roll, the more eccentric the orbit. Exoplanet Sonification Design Layout. Table of beat meanings. Each cell is a quarter note. These images were sonified using 9000 notes in 10 seconds each using a raster scan from top to bottom. 90 pixels across each line and 100 lines down the image were turned into notes based on brightness. Color determined the instrument used from amongst 10 instruments. Because most of the images were black and white, you will hear mostly notes played on a piano. What is the "boundary of our Solar System"? Some things, like a table or a soccer field have clear edges and boundaries. Other things, like cities and towns, have boundaries that aren’t as easy to see. It is hard to say where they end and something else begins if you are looking at them from a distance. Our Solar System has a boundary – but where is it? You could say that the Solar System extends as far as the influence of the Sun. Could the reach of the Sun’s light or the extent of the Sun’s gravity help us decide how far the Solar System extends? The light from the Sun gets fainter as you move farther away, but there is no specific place where the light stops or where it suddenly weakens. Also, the influence of the Sun’s gravity extends without limit, although it is weaker the farther away from the Sun that you travel. There is no boundary at which either light or gravity stops. Neither of these would seem to help us define our Solar System’s "edge." The heliosphere helps define one type of boundary of our Solar System. The solar wind from our Sun blows outward against the material between the stars, called the interstellar medium, and clears out a bubble–like region. 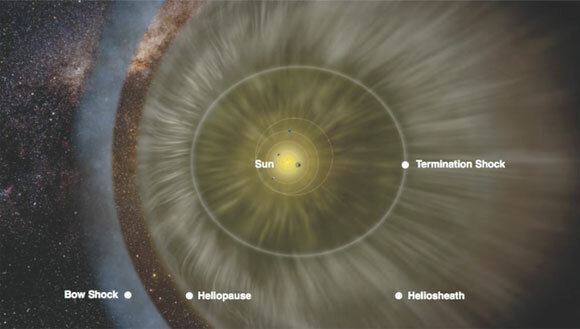 This bubble that surrounds the Sun and the Solar System is called the heliosphere. It is a definable, measureable region in space. IBEX is the first spacecraft designed to collect data across the entire sky about the heliosphere and its boundary. Scientists have used this data to make the first maps of our heliosphere boundary. Our heliosphere boundary does not emit light that we can detect, which means it would be impossible to image using conventional telescopes. Instead of collecting light, like other telescopes do, IBEX collects particles coming from the boundary so that we can learn about the processes occurring there. The boundary of the Solar System protects us from harmful cosmic rays. Without it, four times more cosmic rays would enter our Solar System and potentially damage our ozone layer and DNA. It is important to study this region to know how it works. The following sets of rectangular images depicts the skymap energy at .87 kev collected by the IBEX LO instrument over a period of 3 years. It presents the sky as a series of half circle strips per longitude by latitude position in each column of the image. 30 latitudes per 60 longitude values are presented as pitches played on guitar, plucked strings, or piano depending on whether the color is a tone of blue, purple or black. The image is generated using IDL's color table 1 which is based on the color blue. The sonification algorithm designed by Marty Quinn of DRSRL translates color into one of nine instruments and brightness into one of 43 pitches, using a Spanish Gypsy 7 note scale with a flat 2nd, 6th and 7th comprising 6 octaves. Each ImageMusic example presents the data starting at the 'top' of every column or +90 degrees and moving slowly down each column to -90 degrees. The presentation moves from left to right across the sky starting at 0 degrees longitude to 360 degrees or put another way, from -180 to 0 midway, then 0 to +180 at the right hand edge. The first example presents the data slowly as individual pixels, the second example plays each column as a chord of music and quickly moves across all 60 longitudes in a matter of a few seconds. Each example provides a different way to perceive the data. Obviously, the slower the presentation, the easier it is to hear each individual value that makes up the whole sky, but it is harder to perceive the whole image. The faster presentation, on the other hand, allows for better perception of the whole. At a cost of not knowing exactly which latitude strip is brighter than another, one can compare longitudes more easily and hear the differences across the sky to the level of being able to count the bright areas, and determine whether the sky is uniformly energetic or not, all through the music. NOTE: These are YouTube video links, click on the image to play and click on the space bar to pause or replay. The first video is the presentation of the audio legend. In it we hear the range of brightness and how it maps to pitch. Sonic needles moves from the top of the image, where it is bright, to the bottom of the image, where it is dark, presenting 30 latitude positions down the image as a musical sequence three times. In the visual display, yellow dots appear as each pixel is played. Example 1. Slow playback by 6 x 6 degree square of the sky. Example 2. Fast playback of longitude chords made up of 30 latitude divisions by 6 degree by 6 degree squares of the sky starting from 0 degrees longitude and moving thru 360 degree longitude in 6 degree widths. Can you hear the data? Each sonification has a short quiz at the end. Please try to answer the few questions as best you can so that we can continue to improve our image, data and map sonifications. Click on image to play the Climate symphony. To play the music alone click here: Your browser does not support the audio element. Five galaxy spectra derived from data from the Arecibo Radio Telescope. Please click here. You will be directed to www.drsrl.com. Thank you. Hear the changes amongst four spacecraft during a bow crossing period. © 2012 DRSRL. All Rights Reserved.